The lychee martini (or lichitini) is a beautiful, delicate, and exotic cocktail that features the sweet lychee fruit. It is a delicious vodka martini and very easy to make. If you are unfamiliar with this super sweet fruit, try a whole fruit on its own to get a taste for its natural flavor. Lychees have an interesting sour bite and taste a bit like a strawberry mixed with watermelon and grapes. It is a nice contrast to the sweetness of a liqueur. This martini recipe was originally written for a lychee liqueur. These can be hard to find, though brands like Soho, Bols, and Kwai Feh are available. If you cannot find a commercial liqueur or simply love a DIY project, you can also make your own lychee syrup or liqueur. The syrup will get a lychee martini in your hands much faster, but the liqueur is fun to create as well. Drop a lychee into the glass for a garnish. 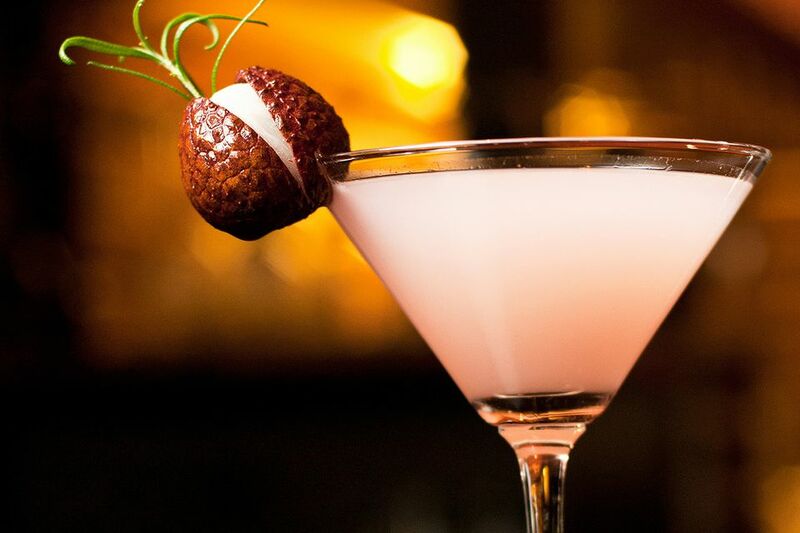 You can also make a lychee martini with a lychee-flavored vodka, such as that offered by Kai Vodka. A few other brands produce it as well, though these tend to come and go on the market. If you choose a lychee vodka, you will want to add a sweetener like simple syrup. For this martini, begin by pouring 2 ounces of lychee vodka, 3/4 ounce simple syrup, and 1/4 ounce lime juice. Shake it up and see what you think. On the second round, you can make adjustments to any of the ingredients to get your desired flavor. Keep in mind that the lychee vodka may not have the same fruit intensity as a lychee liqueur or syrup. If you'd like more, simply use a lychee syrup rather than an unflavored syrup. Lychee syrup is very easy to make. It is no different than any other flavored syrup, you'll simply use lychee fruits for the flavor. It takes less than an hour from start to finish and the finished syrup can be refrigerated for up to two weeks. Fresh lychees are often available in the summer months and take a little preparation. You will need to peel the lychee and remove the stone. Only the fleshy white fruit is needed. You can also use canned lychee fruit and make this syrup year-round. Many international markets carry canned lychee. Bring to a slow boil, stirring constantly until the sugar is completely dissolved. Add 1/4 cup lychee fruit, reduce the heat and cover. Remove from the heat and allow to cool for about 30 minutes. Strain the fruit from the syrup and pour into a glass bottle with a tight-sealing lid. This recipe makes about 1 cup of syrup. It can be adjusted by increasing the sugar and water equally. Time is the biggest factor with a homemade lychee liqueur, but the result is worth the wait. It will take about one month to finish. This recipe makes about 16 ounces or little more than a pint of liqueur. It would be best to start with this small batch until you perfect the recipe to your taste. Take notes on any adjustments you make and, once you have it where you like it, feel free to make a larger batch. Combine 375ml vodka, 2 cups lychee fruit (cut in half), and the zest of 1 lime in a glass jar that is at least 16 ounces. Store in a cool, dark place for four weeks, shaking it every couple of days. Give it a taste test after two weeks, then again after three to see how the flavor is progressing. It may take longer than four weeks to get your ideal flavor. Once the liqueur is flavored to your liking, strain the fruit from the vodka through cheesecloth. Be sure to squeeze all of the liquid from the lychee. Strain again to ensure all of the fruit is removed. During this final filtering, it is a good idea to use a funnel, placing the cheesecloth inside. You can filter directly into the bottle that will store the finished liqueur. Add 1 cup of simple syrup, tighten the lid, and shake vigorously. Test your lychee liqueur. It should be slightly sweetened and have a soft lychee flavor. If it is not sweet enough, add more syrup in small amounts. Shake and test it with each new addition until it suits your taste. If you find that it is lacking both sweetness and fruit flavor, make a lychee syrup and add it instead of plain syrup.